This week’s entry is primarily unrelated to gaming at all, so if you’re looking for gaming stuff, you won’t find it here this week. This week is about some self-discovery I’ve been experiencing this last week, and so may be kinda messy. You have been warned. Last Monday, the TV droned on while I did other things. Katie Couric’s show came on, and they started discussing how a psychological problem had affected a pretty older lady and a man about my age. Being a sucker for a pretty face, I paid more attention. Both described their personal battles with ADHD, and the negative impacts on their lives. There was also a doctor who was treating them and was himself an adult with ADHD. It came out in the course of the segment that many children with ADHD never outgrow it, much less even have it diagnosed. All of these folks described things I’ve experienced. It took a while for that to soak in; nearly a week, even. Impulsive behavior, not completing projects, temperament issues. And then something came along and distracted me (Hint: another symptom). On Friday, I got the dubious honor of being lead driver for the first time. Lead driver is basically a dispatch sort of job, figuring out who is where and can get where, tracking cars transported, etc. It kinda came about because I was the one willing to do it, and the only one truly capable who wasn’t pissed off at management. Two of the drivers had been reprimanded at the start of the shift (and wanted nothing to do with the job), one driver was the wife of one of the reprimanded drivers, one was deaf as a stump, and then there was me. So I took up the responsibility. The area manager and the two drivers who weren’t each other spouses said I did a good job for my first time out. I was (and still am) proud of myself for rising to the occasion. I’ve only been in a management/supervisorial position once before, for a few weeks, and that job was so extremely laid back (a night shift doing tech support for special monitors) and with so little supervision above me that it really didn’t feel like management. I’ve let go of that at this point, especially after starting to research this condition. As I was reading about it, I was seeing quite a bit of myself in the symptoms, and on some review, I can see moments in my past that hammer the idea home. The conclusion I’ve come to is: I’m an undiagnosed adult with ADHD. I’m self-diagnosing, and I know that I could be wrong. Way off, even. As I said, though, I sure seem to fit most of the symptoms on the websites I’ve looked at (WebMD and Wikipedia). Actual diagnosis is beyond my means right now, even if ADHD is a recognized disability, and treatment is way out there. Fortunately, there are ways for me to help myself, like lists and other things to help me keep on track and focused. Coming to this realization the past few days has been like such things are often described. It’s like a light has burst from the clouds and and there was the singing of angels saying “There’s a reason for your life being like it is: You aren’t just a screw-up.” (Low self-esteem is a symptom.) Feeling I have something that I can be aware of means I can monitor my behavior a little better and try to find strategies to self-correct. Being aware of what’s happening, I’m seeing myself getting distracted and trying to refocus on my original thoughts. I could probably write on this forever and a day (provided I don’t get distracted 🙂 ), but really, I’d be going around in circles, and none of us needs that, so I’ll end this week’s post here. I’m the big guy at the end stuffing his face with orange M&Ms. Orange is the color of Greed. Greed is evil. Yeah, you’re counting right. 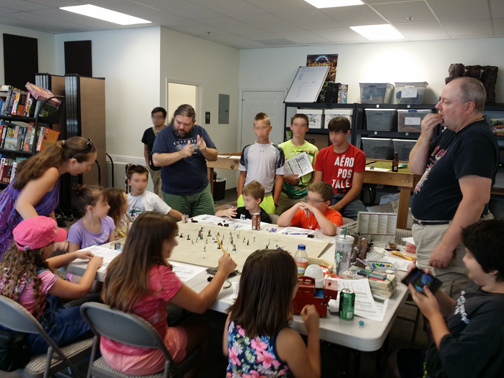 There are twelve kids at this table for D&D For Kids, a monthly game I run at my FLGS, Crazy Squirrel Game Store. …The need for a third DM came almost literally at the last minute. One of the dads shot me a message at 10:45PM Friday that he was bringing his kid and 3 others (which at that hour of the morning became 5 in my head). I didn’t notice and read the message until 2AM yesterday. Luckily, one of the other regular kids couldn’t make it. Otherwise, it went surprisingly well. I had already recruited Rob as a second DM, but I got the wild idea that I would just run a big battle. We had already decided to use an additional encounter seed in the adventure as a “get the new kids more up to speed” scenario and we were going to do two tables until that late notice. When I woke up, I had an idea for expanding that encounter out even more and decided to challenge myself and run the entire thing myself, with all of the kids. It did cross my mind to nix the latecomers kids, but I decided I’d test my chops as a DM and run a mega-game with Rob acting as a floating DM. Lots of minions were on the field, and I kept them coming in waves. Eventually the older kids got the idea they needed to shut that off at the source (a necromancer send[ing] waves of skeletons at the PCs), did that and ended the game. I had had a completely different vision of how the game would work, but I wasn’t able to execute that. I’d have rather[ed] there be multiple DMs who could have handled chunks of the field and kids, but Rob as a floater worked well, because he could field questions for me and worked well getting the parents to help their kids. Except for a couple of kids getting bored between turns, they all seemed to have fun. But next month, I know a couple of the kids won’t be back because they were just visiting Fresno, so numbers will be a little easier to divy up. However, I’m going to add a couple of clauses to the email I send out requiring more than 24 hour notice on the RSVP, so things can be planned better. Again, on the upside, it seems the kids were happy. One of the new kids came around the table to give me a hug, so I guess she liked it. I swear, though: Next month, we will split the table. As well, kids that show up at the last minute may well be turned away, or someone at the store will have to whip out the D&D 5e Starter and run that scenario. So, last Thursday, I started going through my old posts here on the blog. I simply used my tag-link, and I re-read those posts as I cut-and-pasted the material I needed into a new file. As I read, I came to a realization: I’ve made the same decisions repeatedly. Covered the same ground multiple times. That I haven’t got a master file for my thoughts and notes, but have been keeping note tablets that don’t include what’s here means I’ve been thinking and writing in circles. And that’s got to end or I’ll never get this done. So, I exported my outline to a format the apps on my tablet can read, and I’m going to focus less on creating for a while, and more on retyping my notes, so that they’re in digital format, so I can start incorporating them into my outline, and transforming that into a manuscript. Hopefully, a consolidated file will help me focus a bit more and stop going around in circles. I’d rather report progress than to keep reporting the same things every three months. I’ve also been poking around at Pinterest and DeviantArt again. I can loose a lot of time there, as well as my own swipe files. And my swipe files only grow as I look at those sorts of sites. Aye-yi-yi. I’ve also found a number of interesting articles on the FATE game system that is helping me to see how the system can work, and how to GM it. Included in those articles were examples of scenes from famous movies described in game terms. I’ve also found a couple of articles that have pointed me towards the Diaspora SRD for space travel and some elements of science fiction I’m thinking should be present in the StarSea. Really, that’s all for this week. I’m working tomorrow, and I have Living Forgotten Realms tomorrow night, and I need to get some thing ready for both. Later. Last week was another busy week. Work stayed local, for the most part. I got out of town once, and I did get a little done. One of my thoughts was on using the Changeling the Dreaming “realms” for adjudicating what can be affected by magic in the StarSea. Unfortunately, after looking at the old LARP rules (the only rules I have in easy access), I question my thinking. Changeling the Dreaming uses a “verb/object” wild magic system. That is, you have an “Art” (or actually, a number of them) which determines what you can do (your verb), and “Realms,” which determine what can be affected, either by type or area/time (your object). Sadly, only two of the eight or so Realms isn’t extremely specific to the setting. The Dragonlance Saga Edition had something similar, but far too many divisions, and no real “object” section. More accurately, the object is part of the verb and the magical divisions. In that game, there was arcane magic, which only affected directly nonliving things (for example, fire and lightning can be used as an offensive power, because you’re controlling the element, not the target), while divine magic directly affected living things only. At this point, I realize I’m way off track from my original idea. My thought was to simply find something I could use for guidelines for determining difficulties for magic rolls to affect large numbers or spaces. I think part of this can be dealt with by simply re-reading the FATE rules. It’s been a while, and I just took a moment to review some of the pages that deal with areas-of-effect, and that pretty much confirms my need to re-read. I also had some thoughts while reading the second series of the Hawkmoon books. The first book was a bit of a slog. It seemed a bit directionless. It’s obvious that this series is meant to tie Hawkmoon into the Eternal Champion mythos, which isn’t even hinted at in the first four books. There is very little excitement in the first book, and very little of the trademark Moorcock backdrops. In the second book, as Hawkmoon starts off in a severe depression, but is eventually brought around and transported to an alien world in which the humans present live amongst massive trees, so large that they can ride horses on the branches! That made me remember the wondrous elements of Moorcock’s settings, the images my brain created from his writing, and I realized I was missing this sort of fantastic elements in settings I read and run in recent history. D&D 4e mentions fantastic settings frequently, and I feel I was pretty mediocre at this in recent history. I want to describe much more fantastic places. One of the steps in that direction I want to go is towards more unusual worlds. Currently, my worlds are spheres, but I’ve been thinking of going back to flatworlds. I’m not sure yet how I’d handle one side, as I only really want to handle mapping one side of each world, to save myself time and complications. But I like the idea, which is an old one I had discarded and am now revisiting. I’ve also been giving some thought as to how the politics work again. In the real world, as well as the influence of Star Wars, the knighthoods didn’t/don’t directly rule. So, I think I need to do a little research into how the knighthoods of Europe (as I don’t know of any similar organizations in other regions) operated. Building on that aside for a moment, Europe and the Middle East seem to be unique in the creation of the knighthood. While other countries had nobility, only in Europe does there seem to be international organizations like the Knights Templar or Hospitaler that operate separate from the ruling juntas. However, I want to do some further research into these sorts of groups to see how they operated, and apply it to my own knighthoods. Anyway, that’s pretty much all I have for this week. I’m tired, and I’ve got a car recall to deal with tomorrow, so I’ll be headin’ for beddin’ now. Later.